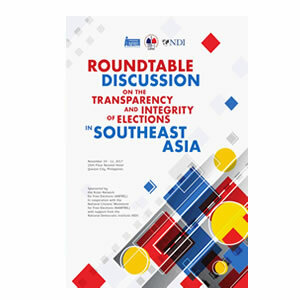 The Roundtable Discussion on the Transparency and Integrity of Elections in Southeast Asia (RTD – TIE in SEA) is a coming together and a forging ahead of the Asian Network for Free Elections’ (ANFREL’s) mission to strengthen democracy and raise the quality of electoral processes in this part of the world. It is a coming together of election stakeholders (election management bodies, civil society organizations, and experts on open election data) from Cambodia, Indonesia, Myanmar, the Philippines, Timor Leste, and from the West to discuss the state of transparency and integrity of elections in their respective countries and in the region. The RTD is a necessary next step in monitoring the progress and status of implementation by participating countries of the 8 Keys for Transparency forged in August 2016 under the Bali Commitment of the Asian Electoral Stakeholders’ Forum (AESF). ANFREL being the convener of the three - AESF, (Bangkok Declaration in 2012, Dili Indicators in 2015, and the Bali Commitment in 2016), it sees itself as the steward, the monitor, as it were, of the agreements and commitments. The RTD is likewise laying the groundwork of the fourth AESF, the Colombo Plan which will be held in August 2018. It was mounted in Manila to coincide with the 31st ASEAN Heads of State Summit being held in the same city. One of the key issues in the summit, alongside security, environment, energy, and economic affairs, was greater participation of citizens in government affairs. Clearly and unequivocally, real citizen participation can only happen in open and free democratic spaces.